In a series of letters going back and forth between Senate Judiciary Chairman Chuck Grassley and Michael Bromwich, the attorney for fired Deputy FBI Director Andrew McCabe, Bromwich is requesting criminal immunity in exchange for cooperation. On May 31st, 2018, Chairman Grassley invited Andrew McCabe to testify [SEE HERE]; On June 4th Bromwich responded [SEE HERE] Grassley is requesting emails McCabe said he sent to Comey about talking to the media. According to McCabe, despite his false statements to FBI and INSD investigators (under oath), his conduct was with the full knowledge of FBI Director James Comey. Grassley was asking for proof. Bromwich responded by saying McCabe doesn’t have the emails, the current FBI does. 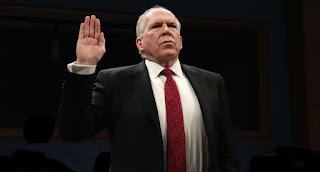 "While I have not yet done so, I am willing to discuss with the Ranking Member your request that the Committee consider seeking a court order compelling you to testify under a grant of immunity. However, under 18 U.S. Code § 6005, seeking such an order requires a two-thirds vote of the Committee, and even if that were to occur, the Justice Department would then have a formal opportunity to delay any testimony and attempt to persuade the Committee not to proceed. Before even beginning to consider whether to initiate that process, the Committee would need to know a lot more about the anticipated scope, nature, and extent of your testimony. The Committee could then informally consult with the Department to solicit its views before deciding whether to proceed formally. (read more)"
According to CNN – Grassley has set the Judiciary hearing for next Monday, but it could be delayed, as the inspector general’s report--while a moving target--is still not public yet. Sources familiar with the report describe it as a massive undertaking, walking through the events leading up to the 2016 election over roughly 500 pages. [CNN twitter] "NEW: Andy McCabe--under investigation--seeks immunity as part of deal to testify before Grassley's panel next week. He may have to plead Fifth if he doesn't get it. Grassley also wants Comey and Lynch to appear before panel on IG report. @LauraAJarrett https://t.co/ymeVO78HgN— Manu Raju (@mkraju) June 5, 2018""
More on IG report about McCabe: "The Inspector General found that McCabe lied to Comey once and lied under oath to investigators on three different occasions in 2017." McCabe authorized FBI senior attorney Lisa Page to leak to Wall Street Journal reporter Devlin Barret, the report states. The leak led to an Oct. 30, 2016, article in the Wall Street Journal that disclosed for the first time the existence of an investigation into the Clinton Foundation. Page is not named in the report, which refers to her instead as “Special Counsel.” Texts between Page and top FBI official Peter Strzok show that both were involved in executing the leak. McCabe authorized the leak at a time in 2016 when his impartiality was in question. Wall Street Journal had just reported that Clinton ally Terry McAuliffe and the Virginia Democratic Party had donated $675,000 to the state senate campaign of McCabe’s wife, Jill McCabe. As deputy director, McCabe was authorized to disclose the existence of the Clinton Foundation (CF) investigation, but only if the disclosure was a matter of public interest. McCabe ordered the leak to “rebut a narrative” “that questioned McCabe’s impartiality in overseeing FBI investigations involving former Secretary of State Hillary Clinton, and claimed that McCabe had ordered the termination of the CF [Clinton Foundation] investigation due to Department of Justice pressure,” the Inspector General’s report states. McCabe then proceeded to lie about ordering the leak. The Inspector General found that McCabe lied to Comey once and lied under oath to investigators on three different occasions in 2017. “However, we concluded that McCabe’s decision to confirm the existence of the CF Investigation through an anonymously sourced quote, recounting the content of a phone call with a senior Department official in a manner designed to advance his personal interests at the expense of Department leadership, was clearly not within the public interest exception,” the report stated. 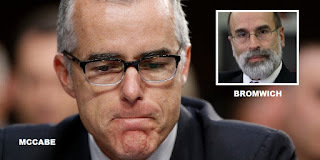 McCabe announced that he would be stepping down from his role in January and went on leave, expecting to retire with a full pension in March. Sessions fired him days before he would become eligible for a lifetime pension. 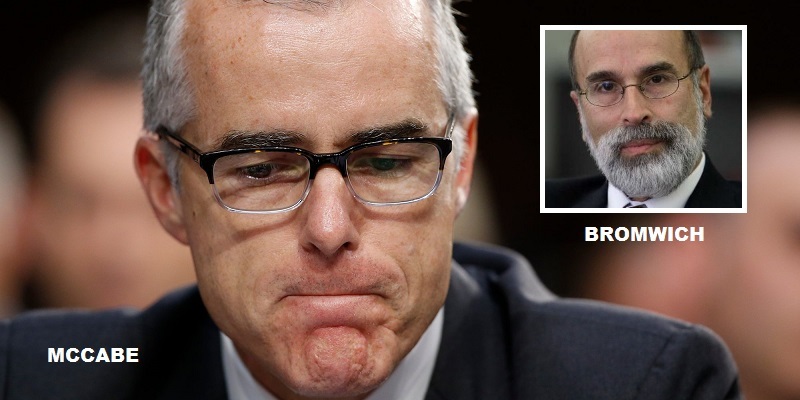 McCabe’s lawyer, Michael Bromwich, issued a statement after the report was released, arguing that the report lacks a motive for McCabe’s alleged leak and subsequent lies. “It is undisputed that Mr. McCabe was one of three senior FBI officials authorized to share information with the media, including on sensitive investigative matters,” Bromwich said in a statement, according to Fox News. “He chose to exercise that authority in October 2016, during one of the most turbulent periods in the history of the bureau, with the knowledge of Director Comey and other senior members of FBI management. His purpose was to protect the institutional reputation of the FBI against false claims, including that a sensitive investigation was being shut down for political reasons.”"